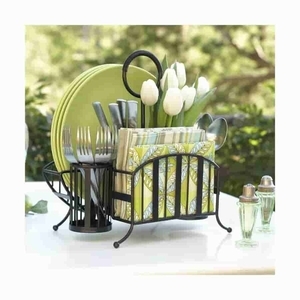 This Unique handcrafted wrought iron Picnic caddy has antique bronze finish, easily Holds oversized plates, napkins, flatware and cutlery; condiments Dimensions 12 in L x 8 in W x 12.75 in H Latice Wrought Iron Picnic Caddy. Care instructions: whipe clean with damp cloth. Accessories not included.